HeatMap Theme PRO v4 now released. HeatMap Theme Pro V4 has now been released to members. Its a massive upgrade, with tons of cool new features. 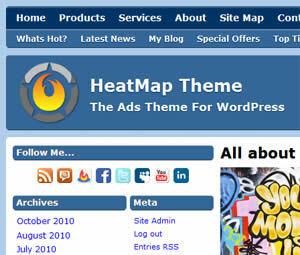 I’ve been having a lot of fun myself giving HeatMapTheme.com a makeover with Pro v4. As you can see HeatMap may be great as an ads theme, but it also makes a great all round theme too! Its an exciting journey for HeatMap Theme right now. If you’ve been thinking about hopping onboard with HeatMap Theme I encourage you to do so today. « Pushing HeatMap Theme to the max!